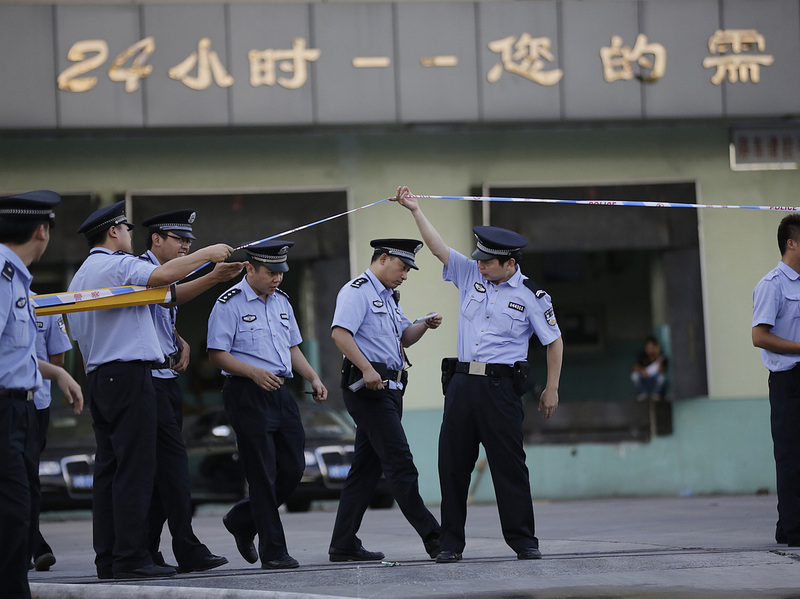 15 Killed In China Ammonia Leak : The Two-Way The government in Shanghai says 26 other people were also hurt in the leak and that six of them are in critical condition. Police officers walk out from the main gate of Weng's Cold Storage Industrial Co. Ltd. at the outskirts of Shanghai, China, on Saturday. A liquid ammonia leak at an industrial refrigeration unit in Shanghai has killed at least 15 people and left six others in critical condition. NPR's Frank Langfitt says the leak occurred before noon on Saturday at a cold storage facility in the city's northern Baoshan District, which handles seafood. Besides the six in critical condition, 20 others were injured, according to the Shanghai government. The Associated Press reports that the government identified the plant as Weng's Cold Storage Industrial Co. Ltd., but gave no further details. The cause of the leak was not immediately known, the AP said. As of the end of last month, more than 27,000 people had been killed or had gone missing in workplace accidents in China, according to the government. Officials said that marked a drop of nearly 14 percent from a year ago.